A recent move by China to tighten recycling requirements has thrown municipal recycling schemes across Canada into turmoil. In a riot of clamouring bottles and backfiring brakes, a week’s worth of your trash gets trucked off to be recycled. It’s all very comforting to those of us who brag that we recycle everything – unless, like half the planet, your town was selling your discards to China. After years of buying over 50 per cent of the world’s scrap paper and plastic to fuel its growing resource-hungry economy, China announced it’s through with being the world’s “garbage dump” and, as of January 1, barred imports of our recycling it says are too often contaminated with garbage and even hazardous waste. 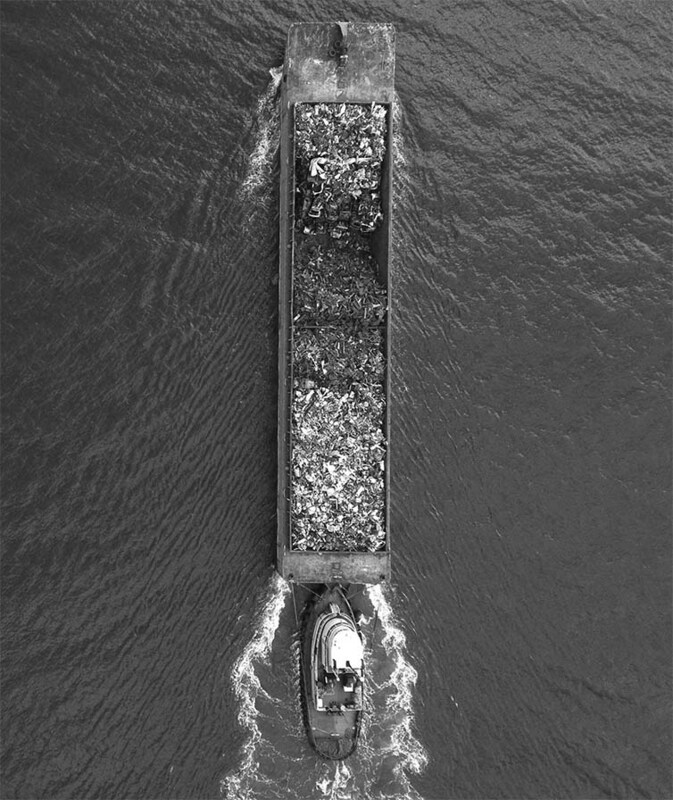 Faster than Canadians could mumble, “Wait, what, we send recycling to China?” mountains of our binned waste started piling up in ports and warehouses from Kamloops in British Columbia to Halifax in the east. With half the recycling market dried up and a glut of recyclables lowering prices, municipalities in Canada and around the globe are playing a cutthroat game of musical chairs as they scramble to find new markets willing to take on our endless tsunami of packaging waste. If you ask them how they’re coping, most Canadian recyclers will give you mealy mouthed answers that everything is fine, but is it? Dig down past the heaps of paper and plastic orphaned by the Chinese rule change and you’ll find a recycling system in deep disrepair. Considering Canada produces more waste per capita than any other developed nation and nearly three-quarters of that waste still ends up in landfill, now may be the perfect time to tackle our trashy habits. Canadian municipalities have yet to go as far as some American and Australian towns that are suspending curbside recycling pickups, but the China crackdown has undeniably left many Canadian towns in the lurch. Last checked, Calgary, which sent 50 per cent of its recycling to China, was warehousing 10,000 tonnes of recyclables, and counting, with nowhere to go. In Halifax, where roughly 80 per cent of recycling was going to China, 100 tonnes of plastic bags and other low-quality plastic film has been trucked to out-of-province landfills. Halifax’s recycling manager Matthew Keliher says, at this point it’s found new homes for most of its recyclables (“that could change next week”), but new loads of shopping bags, bread bags and the like are being burned as fuel at Canadian cement kilns. Not quite the happy 3R ending Haligonians would expect from popping plastics in their recycling bins. The mess prompted Nova Scotian officials to say they’re “seriously considering” a province-wide ban or levy on the 300 to 500 million plastic bags used there every year. “Don’t waste a crisis, ban the bags!”, prompts the #BanTheBag petition by Halifax’s Ecology Action Centre. Across the country, a growing chorus of industry insiders and environmental groups seem to agree on one thing: We need to use this moment to clean house and up our game. “It’s a wake-up call,” says Recycling Council of Ontario’s Jo-Anne St. Godard. “We might have been taking some things for granted and got a bit lazy.” Part of the issue, says Godard, is that municipalities have been pumping money into subsidizing weak markets for tough-to-recycle materials like plastic film and Styrofoam when few recyclers want the stuff. Others say municipalities have been far too lenient on residents, and that in trying to make it as easy as possible for home owners to recycle we’ve ended up with bins full of trash. Sure, dumping all our paper, plastic, glass and cans in a “single stream” instead of in separate bins or bags has been mighty convenient for residents in cities like Toronto, Edmonton and Gatineau. But tossed into one bin or truck, stacks of paper are much more likely to get smeared with tomato sauce and embedded with broken glass, making entire bales unsellable. And all that glass we bin can get so contaminated with bits of ceramic, metal lids and batteries, much of it gets landfilled in places like Québec. In Ontario, Peel region’s single stream led to papers so contaminated that its paper recycler, Canada Fibers, was left holding the bag when China wouldn’t take the 13,000 tonnes it had bought from Peel. The regional municipality may now have to cough up the $1.7 million Canada Fibers lost, as well as another quarter million to try cleaning up its paper stream with high-tech sorting equipment. “It’s that mentality of a catch-all,” says Howland. “People just put everything in [single stream bins]. Yes, TVs and VCRs are recyclable; they’re just not recyclable in the blue carts.” Ditto for the compostable crusts left in your pizza boxes. Drilling that home with residents is pretty crucial since, technically speaking, China isn’t banning all recycling imports; it’s just that bales of paper and plastic can have contamination levels of no more than 0.5 per cent. Can cities like Calgary or Toronto get there? “Some might say it’s unachievable,” says Howland. At this point, contamination levels are so bad in Toronto, the city threw out 52,000 of the 204,000 tonnes of recycling collected in 2016, saddling the city with millions in processing costs and lost revenue a year. Toronto has started sending inspectors to scrutinize blue bins and may soon start levying $20 fines just to try to push those contamination levels below 25 per cent. So what would a reimagined recycling system look like? Many point to British Columbia’s four-year-old system that, for the first time in Canada, puts the full legal, financial and operational onus for paper and packaging recycling on the brands producing all this waste to begin with. Yeah, most provinces already have some sort of Extended Producer Responsibility (EPR) in place, where brand holders/producers foot the cost of, say, tire or electronics recycling. But even if producers front half or all of the funds for residential recycling programs, individual municipalities have still been left to fend for themselves, struggling with stalled recovery rates. Not the case in B.C., where municipalities are contracted to do the collecting, but that’s it. Allen Langdon, managing director of Recycle BC, the nonprofit stewardship agency tasked with running the system on behalf of B.C.’s brand holders/producers, says, “Because we’re operating an entire province we can look at it from a systems perspective. It also means we made a lot of tough decisions when we launched.” They removed contamination-spiking glass from curbside pickup and either collect it separately in a small grey box, as Vancouver does, or at one of 200 depots so it doesn’t get smashed. They did the same with plastic film, which Langdon says tended to get caught in sorting machines. Ontario’s environmental commissioner, Dianne Saxe, has publicly criticized B.C.’s producer-run system for not offering curbside collection to smaller, remote communities that are costlier to access. But B.C.’s contamination rates are undeniably lower than Ontario’s, averaging around 6 per cent, which, says Langdon, makes it a heck of a lot easier to try hitting China’s 0.5 per cent plastic and 1.5 per cent carried wastes targets than when you start with 25 per cent contamination. It also means B.C. was able to keep shipping paper to China when other provinces had been cut off, and its cleaner loads have, according to Langdon, made it easier to secure access to intensely competitive alternative markets. And thanks to a deal it made with a domestic recycler, all of B.C.’s plastics get recycled in province by one firm, Merlin Plastics. Tellingly, Merlin’s founder has just set up shop with an upgraded plastic recycling facility in Sarnia, Ontario. Inevitably, the China ban will bolster Canada’s domestic recyclers like Merlin and, if all goes well, so should Ontario’s coming shift to a B.C.-style full producer responsibility system for blue boxes. There are no ‘recycle local’ mandates, per se, but Geoff Rathbone, of Ontario’s newly minted Resource Productivity and Recovery Authority, says the Waste-Free Ontario Act is “all about trying to ensure this closed loop for materials in Ontario.” Assuming the draft plan is approved before Ontario’s June election, the new producer-run blue bin system should be in place by 2025. If more provinces follow suit, can full EPR spur the great reduction in packaging and “design for the environment” promised but not yet delivered by past initiatives? There’s a lot of hope resting on full producer responsibility legislation like the Waste-Free Ontario Act to not just clean up the recycling stream but also push us towards a circular economy where recycling becomes a last resort, after reducing and reusing. Higher tipping fees at dumps and pay-as-you-throw schemes for residents that factor in the full social and environmental costs of landfilling and recycling might help, says Jonathan Arnold of Canada’s Ecofiscal Commission. 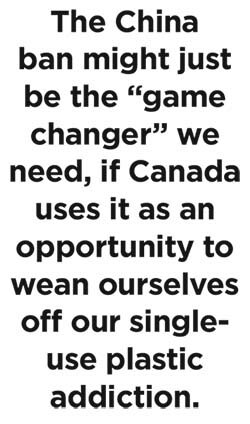 The China ban might just be the “game changer” we need, says Tony Walker of Dalhousie University’s School of Resource and Environmental Studies, if Canada uses it as an opportunity to ween ourselves off our single-use plastic addiction. Bringing in an EU-inspired directive that says all plastic packaging must be reusable or recyclable by 2030 could inch us closer to that vision.